France: Disneyland® Park entrance or Chateau & Gardens of Versailles-, City tour of Paris and River Seine boat cruise and Eiffel tower (2nd level). This morning arrive at your dedicated pick up point where you receive a warm welcome from your Tour Director after settling in on the coach you proceed onto Dover. On arrival admire the white cliffs before boarding ferry for the short channel crossing over to Calais. Once you arrive into the port, you continue yourjourney towards Brussels. Here your orientation tour includesthe Atomium structure (photo stop), a visit to the Grand Place as well as a stop to see the Mannekin Pis. 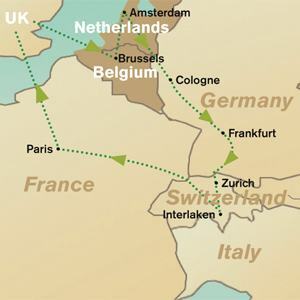 Continuing your journey, you will arrive into Holland and check into the hotel for two nights. After breakfast, you drive towards The Hague, the political capital of The Netherlands, you start by visiting the Keukenhof flower gardens (between 22nd March to 20th May 2012). After this period you will visit the famous Madurodam model village. Later, enjoy a demonstration on the art of making wooden shoes at the Clog Factory & Cheese Farm. You then proceed to the famous fishing village of Volendam. Later proceed to Amsterdam to visit the renowned Diamond factory, continuing on you will discover the city in the most novel manner, as you take a canal cruise on the intricate waters which is best way to see this captivating city. After breakfast, you drive to Switzerland through the famous Black Forest region of Germany. You’ll stop at the Drubba Centre, which is in the heart of the forest, where you have an opportunity to buy Cuckoo clocks & other souvenirs. Later you’ll proceed to Schaffhausen to see the gigantic Rhine Falls, Europe's largest plain waterfalls. You have some free time to admire the thunderous beauty of the falls. On arrival in Switzerland, enjoy an Indian dinner. Check into your hotel in Switzerland for next three nights. Today’s highlight of the tour is the visit to the highest viewpoint in central Switzerland. A wonder that is not to be missed, ascending the Mt Titlis to witness a spectacular view of glacier grotto (ice cave) and icefalls. This is viewed directly from the ROTAIR - the world’s first revolving aerial cable car on Mt Titlis at 10,000 feet. Later proceed for an orientation tour of Lucerne, one of the six most frequently visited cities in the World. See the Lion Monument, which is designed as a memorial for the mercenary soldiers. You may take a stroll across the Kappelbrucke - the world’s oldest covered wooden bridge. Today you start your day by visiting Interlaken- a picturesque town situated between two lakes. You start by taking an exciting excursion to Mt. Jungfraujoch, the highest altitude railway station in Europe at 11,133 ft. Marvel at the changes in alpine scenery as your charming cogwheel train takes you on a unique journey to Mt. Jungfraujoch. Experience the magic of the mountains at the Sphinx Terrace. Also, visit the Ice Palace, where you see a beautiful display of sculptures made of ice, while being encased in ice yourself. Do not forget to send a postcard to your friends and family from Europe's highest post office with its own special postmark. This morning you embark on a city orientation tour of Geneva which includes photo stops at the United Nations’ building, the flower clock, the Reformation Monument and the famous Lake Geneva. Later you leave the Swiss Alps behind and head towards Paris. Upon arrival, enjoy a scenic boat cruise along the River Seine. You will be enchanted as you pass by many of the Parisian monuments including the Alexander II Bridge, the Orsay Museum, the National Assembly and Paris' own Statue of Liberty. Tonight enjoy an exciting optional Lido Show which has been a venue for the finest shows since 1946. Today you have a 1 day ticket to either Disneyland® Park or Walt Disney Studios® Park. Disneyland® Paris is Europe’s leading tourist destination with world class attractions, shows & parades like Crush’s Coaster*, Cars Race Rally**, The Twilight Zone Tower of Terror ™+, Indiana Jones™ and the Temple of Peril, Space Mountain: Mission 2, Big Thunder Mountain and many more. From 6th April 2012 come and experience Disneyland Paris’ the new yearlong celebration, Disney Magical Moments Festival where a collection of unforgettable Disney moments are waiting just for you. You will travel to a small town outside Paris, Versailles the former residence of the famous “Sun King” where you visit the Chateau and the Gardens of Versailles, which count among the most prestigious of the world’s heritage sites. It represents the most accomplished achievement of 17th century French Art. You will get the chance to visit the famous State Apartments of the King and Queen, and the Hall of Mirrors. Later you will drive down to central Paris, to see the Opera House, Concorde Square, Champs Elysees, Arc de Triomphe and other historical sites. You will also have some free time at the Louvre Museum (entrance not included) where you can see the famous Leonardo da Vinci's Mona Lisa and other spectacular paintings and sculptures, or can just just indulge in some free time for shopping. This morning, check out of the hotel and proceed to visit the top floor of the Eiffel Tower (Subject to availability). Later you embark on an orientation tour of Paris where you will drive through and see some of the most famous sights such as the Champs-Elysees street, the Bastille building, ArcDe Triomphe, Louvre museum, Concorde Squareand many more historical monuments. In the early afternoon you depart for Calais for the ferry crossing to Dover. Upon arrival, you proceed towards your final destination. Your tour ends here and bid farewell to all friends you have made on the tour.